It’s time to reconceive environmentalism and sustainability and help them evolve into a larger movement. *Author Richard Louv is the author of The Nature Principle: Human Restoration and the End of Nature-Deficit Disorder and Last Child In The Woods: Saving Our Children from Nature-Deficit Disorder. The more high-tech we become, the more nature we need. Even as biodiversity and traditional connections to nature fade, an almost religious faith in technology suggests that, well, we don’t need nature much anymore. We hear talk of a “post-biological” era in which human beings are optimally enhanced by technology. Yet, we’ve only begun to study how the natural world can optimize human health and intelligence. Technology will always be with us, but as it grows, we’ll need an antidote to its downside. More than half of the world’s population now lives in towns and cities. If human beings are to enjoy nature, they’ll likely have to do it in urban areas. This transformation will produce one of two outcomes: either the end of meaningful daily experience in nature, or the beginning of a new kind of city and a new view of our role in and our definition of nature. Adults have nature-deficit disorder, too. In recent years, the children and nature movement has revealed a vein of hope. That effort has brought people together across party lines and religious and economic divisions. But the children and nature movement will not succeed unless adults come to see the importance of our own connection to the natural world. Environmentalism needs to hit reset. The environmental movement’s many successes did not prepare us for even larger global challenges, including climate change and the human disconnection from the natural world. Poll after poll now shows that environmental concern, in some areas, has dropped to its lowest point since before Earth Day 1970. Why? Economic recession. A well-financed campaign of disinformation. An inability to describe a great future. For whatever reason, environmentalism remains a pup tent. We need a bigger tent. In fact, we need a river. Sustainability alone is not sustainable. Though we don’t have a better word to replace it, the word sustain suggests stasis. Fairly or not, much of the public views energy conservation and the development of alternative energy sources as essential but ultimately technical goals. We need more than stasis; we need to produce human energy (health, intelligence, creativity, joy) through nature. Conservation is not enough. Now we need to “create” nature. Even if we conserve every square foot of remaining wilderness, and we should, it won’t be enough to guarantee the biodiverse habitats that humans and other organisms will require to thrive. In addition to conservation, we must now restore or create natural habitats on our farms and ranches, in our cities, neighborhoods, commercial buildings, yards, and on our roofs. We’ll need the true greening of America and the rest of the world. We have a choice. If we see only an apocalyptic future, that’s what we’ll get, or close to it. But imagine a society in which our lives become as immersed in nature as they are in technology, every day, where we live, work, learn and play. Imagine a future in which our intelligence and creativity, our ability to feel and be fully alive is enhanced by more frequent contact with the natural world. 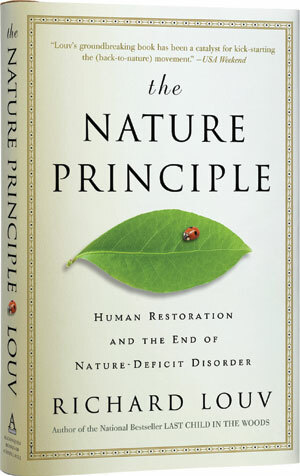 This essay is adapted from Richard Louv’s The Nature Principle: Human Restoration and the End of Nature-Deficit Disorder (Algonquin Books, 2011). Richard Louv is also the author of Last Child In The Woods: Saving Our Children from Nature-Deficit Disorder. He is Chairman Emeritus of The Children and Nature Network.